Belkasoft updates its flagship forensic product, Belkasoft Evidence Center, to version 3.6. The new release adds forensic support for a number of popular social networks, P2P file exchange clients, online email services and multi-player online games. By continuing adding forensic support for today’s most popular online services, Belkasoft strives to increase the efficiency of its product, further enhancing the efficiency of forensic investigations and simplifying the process of obtaining digital evidence. With added support for new social networks, P2P clients, online multi-player games and popular webmail services, Belkasoft Evidence Center 2012 locates more evidence than ever, boosting the number of recoverable artifacts to 110. In version 3.6, Belkasoft Evidence Center 2012 adds support for a number of additional social networks, online email services, P2P communication and file sharing products. Google+ and Orkut (a popular Brazilian social network) are now supported, as well as two huge webmail services, Hotmail and Yahoo Mail. A range of peer-to-peer file sharing and information exchange clients is added, including mIRC, Frostwire, Torrent, and Gigatribe. Newly supported multi-player games include Karos and popular World of Warcraft. With added support for new social networks, P2P clients, online multi-player games and popular webmail services, Belkasoft Evidence Center 2012 locates more evidence than ever, boosting the number of recoverable artifacts to 110. This high a number of recoverable artifacts makes Belkasoft Evidence Center 2012 a class-leader, allowing investigators recover more data easier with less missed evidence. At version 3.6, the company’s flagship computer forensic tool enables security and forensic specialists collect and analyze more digital evidence than ever. Belkasoft Evidence Center will automatically locate, process and analyze Internet chat logs, Web browsing history and email communications including information stored in cookies and digital pictures, mailboxes and system files. Low-level access to hard disk and system structures means that even data that’s been deleted by the suspect cannot escape from investigators. Belkasoft Evidence Center makes evidence analysis easier by natively mounting and access images created with Encase, DD, and SMART without using these or any third-party tools. The affordable Standard edition is available to private investigators and corporate security departments, while the more comprehensive Enterprise edition allows major security agencies and police departments to have multiple investigators work simultaneously on a case. 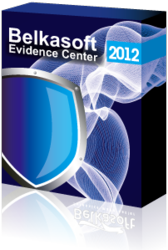 Belkasoft Evidence Center 2012 is available immediately. Pricing for Forensic IM Analyzer edition starts from $499.95, while the Enterprise edition is available from $9999.95. Current customers having valid (unexpired) licenses may upgrade to the new product for free. Founded in 2002, Belkasoft is an independent software vendor specializing in computer forensics and IT security software. Running on the Microsoft Windows platform, Belkasoft products back the company’s "Forensics made easier" slogan, offering IT security experts and forensic investigators solutions that work right out of the box, without requiring a steep learning curve or any specific skills to operate. Belkasoft Evidence Center 2012 replaces all Forensic IM Analyzer, Forensic Studio, Forensic Carver, Browser Analyzer and other products used in forensic investigations, law enforcement, intelligence, corporate security and parental control applications by integrating their functionality into a single all-in-one product. Registered users of the above products may be eligible for a free upgrade. Belkasoft customers include the FBI, US Army, US Secret Service, police departments in Germany, Norway, Australia, and New Zealand, PricewaterhouseCoopers, and Ernst & Young. More information about the company and its products is available at http://belkasoft.com. The complete list of new features added in Belkasoft Evidence Center 2012 3.6 is available at http://forensic.belkasoft.com/en/bec/en/Whats_New_In_Version_3.6.asp. Belkasoft made the demo version available for free download at http://belkasoft.com/bec/en/Evidence_Center.asp.